Uses: Conference Area/Meeting Room, Office, Training Colors: Browns/Tan/Beige Lengths: 7 panel 13'-1" Heights: 8'-0"
We were very fortunate to form a relationship with the California Mentor program. They came to Screenflex needing to maximize their conference room space. The Mentor program needed folding walls for training area in their current facility. 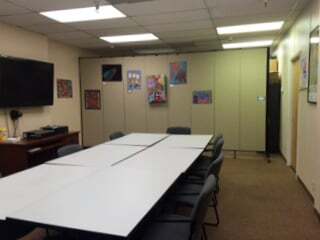 After working with a Screenflex sales consultant, California Mentor purchased an 8 feet tall room divider to divide their conference room into a space for meetings and a training room. They added an optional swinging door for easy access between the two rooms. The tall portable walls absorb ample sound between the two rooms while allowing light and air conditioning and heating to travel between the two rooms as well. “Our conference room looks great now. We are able to hang pictures that we have bought from our disabled clients and now they get to see them in a better environment”, adds Heather Odle.